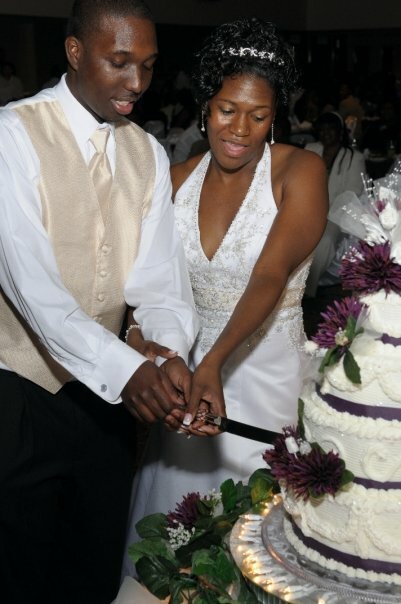 The bride and groom met while both were in college at North Carolina State University. They had a chemistry class together and became best friends. They remain best friends today! As a way to stay on a a tight budget, none of the flowers used in the wedding were real. Guests did not notice the difference. The bride, the mother-of-the-bride, and several bridesmaids made the bouquets used in the ceremony. Wedding guests enjoyed a lavish reception at Johnston Community College immediately after the ceremony. Two of the bride and groom's children were in the wedding. Kendall was 6 and Caden was 22 months old. The couple accidentally left one of their baby son's shoes at home on the day of the wedding. Thus, the son was wearing a tuxedo and his everyday brown Stride Rite shoes.